Bay Resistance | Protest the New Muslim Ban! San Francisco Bay Area, it’s time to step up once again to fight back against state violence and the racist attacks against immigrants, indigenous, Black, Brown and all oppressed communities. 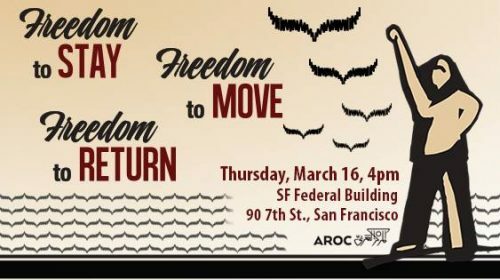 Meet us on March 16th, the same day that the new version of the Muslim Ban will come into effect, to protest in San Francisco and demonstrate our power and commitment to our collective freedom to stay, move, return, and live in dignity. To endorse please email: info@araborganizing.org with subject “endorse”. In the wake of Trump announcing his latest version of the “Muslim Ban,” targeting Arabs, Africans, South and West Asians from Iran, Yemen, Syria, Sudan, Libya and Somalia, AROC joins with our allies and partners to affirm our ongoing commitment to community self-defense and resistance. It’s still a Muslim Ban. Trump’s recent Executive Order uses longstanding racist “National Security” and “War on Terror” policies to justify it’s legality. The Ban targets people from the very same countries that the U.S. has destabilized and attacked through war, bombing, and drone strikes for years. It’s another chapter in the war on Black and Brown communities. Since taking office the Trump administration has furthered the war on Black and Brown people in the U.S. It has systemically attacked the indigenous people of this land, criminalized immigrants, expanded policing, and is literally ripping apart families and communities on a daily basis. Standing against this repression means fighting alongside and in solidarity across our all our communities and movements. We will continue to organize and resist. Because of grassroots organizing and public outrage, Trump’s administration has been met with massive resistance in the streets, schools, and courts. See you in the streets on Thursday.